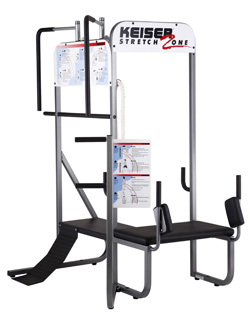 Keiser's Stretch Corner is capable of accommodating many of the same stretches as the Stretch Zone, while occupying less floor space. With a footprint of only 23.6 square feet, it not only fits almost any facility, but since four people using the Stretch Corner take up less room that they would lying on the floor, you can actually recaputre valuable footage. Like all Keiser equipment, the Stretch Corner is built to take years of hard use. Which is why it\'s backed by a 10-year structural warranty. And like its big brother, it can handle a minimum of 17 stretches from head to toe, and lots of places in between. In fact, about the only thing the Stretch Corner won't stretch is your budget. Which could easily make it the most cost-effective piece of equipment in your facility.